The presence of arthritis was measured as the population aged 12 or older who reported that a health professional had diagnosed them as having arthritis. Prior to 2007 respondents were asked "Do you have arthritis or rheumatism, excluding fibromyalgia?" In 2007, the word "rheumatism" was removed from the question. Arthritis is an important indicator of population health because it is a highly prevalent chronic condition that affects the daily life of many Canadians and places demands on the health care system. Arthritis is a highly prevalent chronic condition that increases with age. This has implications for Canada's aging population1. Arthritis is associated with mobility limitations and dependency in activities of daily living1. Canadians who reported arthritis were more likely to use medications and be multiple medication users2. Studies have found an association between arthritis and hormone replacement therapy (HRT). Long-term HRT increases the risk of arthritis in middle-aged and older women3. Arthritis has also been associated with falls and fractures4,5. Men and women who were obese had higher odds of developing arthritis than did those who reported acceptable weight6. Arthritis and/or rheumatism was the most commonly reported chronic condition among Métis adults; at 21% it was more prevalent among this population than for Canadians as a whole (13%)7. 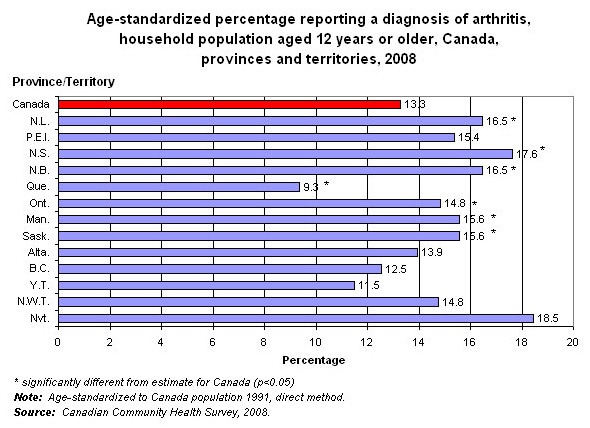 The age-standardized prevalence of arthritis in Canada remained relatively stable from 2000/2001 through 2008. Females were consistently more likely than males to report a diagnosis of arthritis. Note: Age–standardized to 1991 Canada population, direct method. Prior to 2008 respondents were asked "Do you have arthritis or rheumatism, excluding fibromyalgia?" In 2008, the word "rheumatism" was removed from the question. 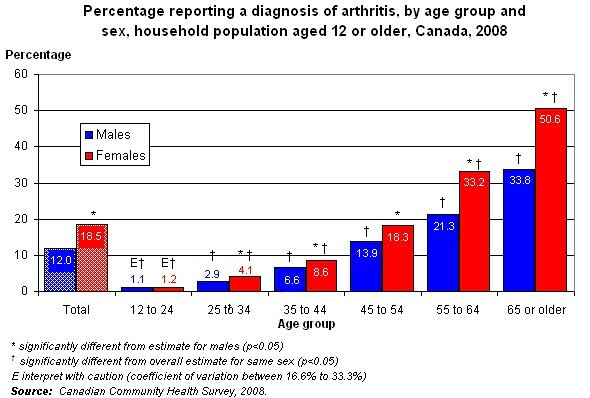 In 2008 15.3% of Canadians aged 12 or older reported a diagnosis of arthritis (4.3 million): 12.0% of males (1.7 million) and 18.5% of females (2.6 million). In every age group except the youngest (12 to 24), females were more likely than males to have arthritis. The differences were large at older ages: among people aged 65 or older, females were 50% more likely than males to report a diagnosis of arthritis. Arthritis is relatively uncommon at ages 12 to 24—just over 1 in 100 people reported a diagnosis of arthritis in 2008 (1. 1% of males and 1.2% of females). As in other countries8, arthritis in Canada becomes increasingly prevalent with advancing age; approximately one in three (33.8%) senior males and one in two (50.6%) senior females reported arthritis in 2008. Although arthritis is associated with aging, a substantial number of Canadians in their prime working years report this condition. At ages 45 to 64, for example, 17.2% of males and 24.8% of females, representing more than 1.9 million people, reported a diagnosis of arthritis in 2008. The age-standardized prevalence of arthritis varied considerably across the country. 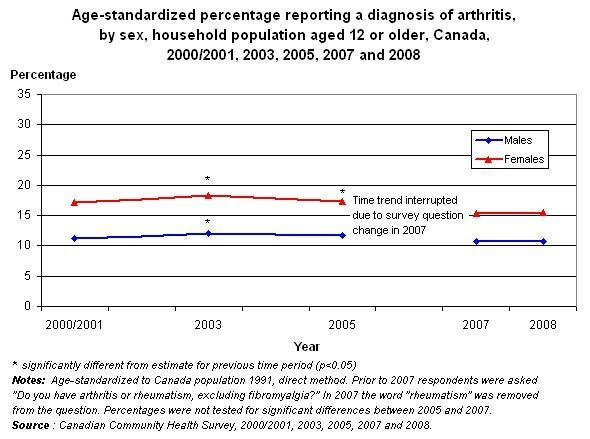 In 2008, Quebec residents were less likely than Canadians overall to report arthritis. The crude estimates of arthritis were significantly lower in Alberta and the territories than in Canada overall, but these differences disappeared once the younger age structures in these areas were taken into account. For Prince Edward Island, the crude estimate of arthritis was significantly higher than for Canada overall but once the older age structure in the province was taken into account, there was no significant difference. For the remaining Atlantic provinces, Ontario, Manitoba and Saskatchewan, estimates of arthritis were higher than for Canada overall, even when differences in age structure were taken into account. Note: Age–standardized, direct method to 1991 Canada population. 1. Wilkins K, Park E. Chronic conditions, physical limitations and dependency among seniors living in the community. Health Reports (Statistics Canada, Catalogue 82-003) 1996;8(3):7-15. 2. Ramage-Morin P. Medication use among senior Canadians. Health Reports (Statistics Canada, Catalogue 82-003) 2009;20(1):37-44. 3. Wilkins K. Hormone replacement therapy and incident arthritis. Health Reports (Statistics Canada, Catalogue 82-003) 1999;11(2):49-57. 4. Wilkins K. Health care consequences of falls for seniors. Health Reports (Statistics Canada, Catalogue 82-003) 1999;10(4):47-55. 5. Carrière G. Hip fracture outcomes in the household population. Health Reports (Statistics Canada, Catalogue 82-003) 2007;18(4):37-42. 6. Wilkins K. Incident arthritis in relation to excess weight. Health Reports (Statistics Canada, Catalogue 82-003) 2004;15(1):39-49. 89-637) Analytical Paper no. 004, February 2009. 8. Woolf AD, Pfleger B. Burden of major musculoskeletal conditions. Bulletin of the World Health Organization 2003, 81(9). Millar WJ. Hip and knee replacement. Health Reports (Statistics Canada, Catalogue 82-003) 2002;14(1):37-50. Wang PP, Badley EM. Consistent low prevalence of arthritis in Quebec: Findings from a provincial variation study in Canada based on several population health surveys. Journal of Rheumatology 2003; 30(1): 126-31.